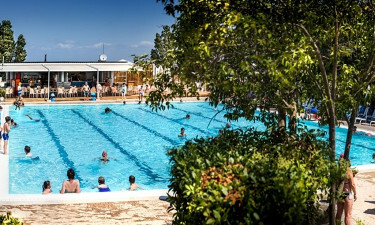 Nestled in the shade of thick, aged pines near the heart of Rome, Camping Village Fabulous is the perfect luxury camping site to start your Roman adventure and explore the culture of the Mediterranean. This campsite has an excellent location with everything you need within range: Beach 10 km. Metro station to Rome 8 km. Ciampino airport (Rome) 19 km. Wide variety of accommodation-type available, from small one-bedroom bungalow tent to large family units up to three bedrooms and living area. Well connected to Rome by bus and metro services. Extensive on-site facilities, including restaurants, bars, and a number of entertainment options. 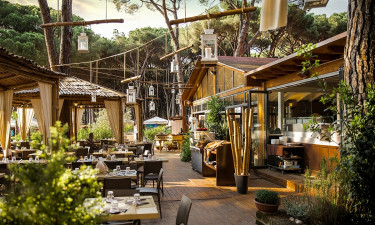 Located just on the outskirts of Rome in the thick pine forests that inspired many Roman legends, Village Fabulous lies halfway between the city and the Mediterranean Sea. Ostia, the historic harbour town of Ancient Rome, is barely 8km away. This seaside town is home to the castle Ostia Antica and the famous Ostia Antica amphitheater that dates back to 335BC. There is a regular shuttle service to both Ostia and Rome from the camp, making it wonderfully well-suited for exploring the region. Guided tours to Naples and the countryside are also available to help you make the most of your camping holiday. As with other Lux-Camp listings, Camping Village Fabulous offers several mobile home and luxury tent options. The smallest option is the single bedroom, single bathroom “Bungalow”. Larger parties can opt for the two-bedroom “Boticelli” or “Giotto” units. The largest units – called “Leonardo” – boast there-bedrooms and can comfortably sleep 7-8 people. All units come equipped with well-furnished, luxurious private bathrooms. Heating and air-conditioning are available as required. A massive water-park locally called the 'Lagoon' is the central attraction in this luxury camping place. 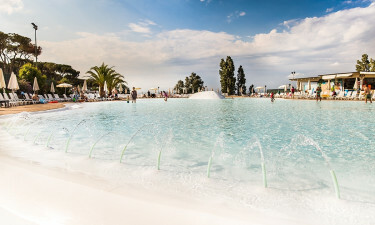 Vast shallow pools under the Mediterranean sun promise endless fun for kids and parents alike. Besides the Lagoon, there are also two whirlpools and one large sports pool to beat the summer heat. You can also relax at the mini-golf course, play a game of billiards or tennis, or just wind down with some live music at the Bare Elite on your camping holiday. Savour authentic Italian cuisine within the campsite itself at the popular Favoloso Bar & Restaurant, which serves fresh-baked pizza, scrumptious Italian dishes and the choicest local Italian wines. For breakfast and brunch, stop by Bi Trattoria which is particularly well-known for its coffee. Seafood enthusiasts will love the fresh fare at Ferrieri. If you fancy dinner at home, there are a number of local takeaway places as well, from the popular A Tutta Pizza to Tanto Tempo Fa. A large local market and bazaar within the campsite will serve all your grocery needs. From fresh fruit and bread to Italian wines and body care, you'll scarcely need to venture outside the bazaar to find what you need. You can also get your hands on camping gear, hardware equipment and souvenirs under the same roof. For additional shopping needs, the fabulous markets of Rome are just a short drive away!